OMA Ghana and OMA Togo staff made a huge difference on Saturday 8th December. 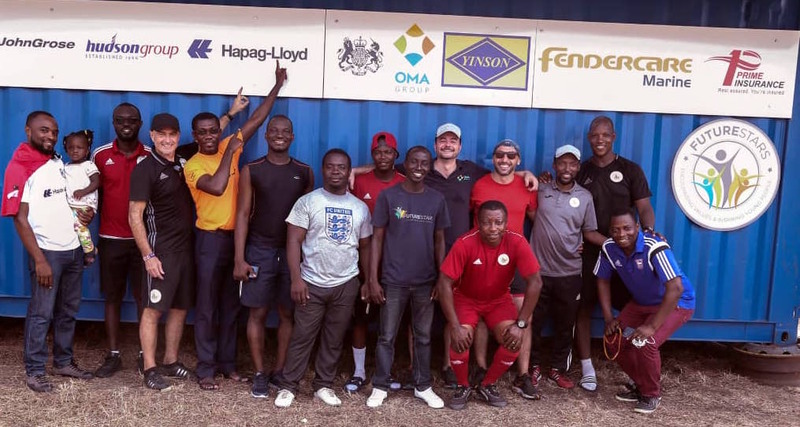 As part of CSR project Futurestars, a kit amnesty in the UK culminated in a full 40ft container (kindly donated by partners Fendercare), containing hundreds of boots, kit and equipment. So many companies in the UK were involved in donating kit, time and services to allow the container to be stored, filled and shipped. The container now has a roof and fitted with shelving and will be a much needed store room for Futurestars coaches at its permanent home at the Tema stadium. A big thank you to everyone who attended and to Simon Milton, Futurestars director, Titus Bramble, Futurestars Ambassador & Lead Coach and Emmanuel Okyne-Tetteh, Futurestars project manager in Ghana for making it happen. Next stop Togo!